If Ferrari don't get him into their academy soon Merc will pounce. I bet he would love to drive for the team where his father had most of his success. Mick is doing well in his current Formula. If he wants to join the academy, he will. I doubt we'll see Mick in Ferrari in the near future. He's been sponsored by Mercedes since his early days and I think he would remain loyal to them as for now. I think that Mercedes wouldn't be giving up on him either, especially if he continues with this kind of driving + not to mention how attractive his name in auto-moto world is. But for sure I hope that, if he's keeps proving that he's the real deal, we'll see him in Maranello somewhere in the future. If Mick is going to make it, he will have to be mentally strong as hell, as the haters will come down on him like a ton of bricks non-stop! Dan Ticktum has said that he finds Mick Schumacher’s sudden surge in F3 “interesting” after he stormed to the top of the standings. Schumacher narrowed the gap to Ticktum considerably after claiming a hat-trick of victories at the Nurburgring in Round 8 and has now leapfrogged the Red Bull junior driver with a further two wins and a second place at the Red Bull Ring over the weekend. 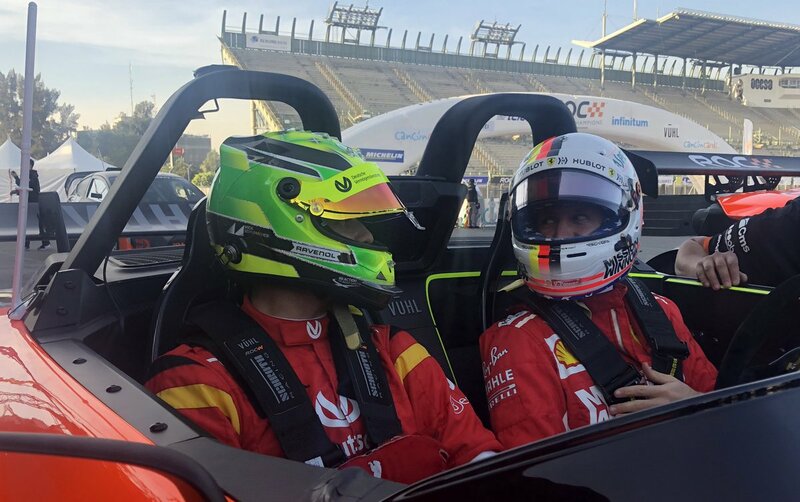 As a result, the son of legendary seven-time World Champion, Michael Schumacher, has opened up a 49-point lead with just one round remaining at the Hockenheimring. Ticktum had long been in control of the F3 championship, and took to Instagram after the race to raise doubts over Schumacher’s massive improvement in form. “Not ideal is the best way I can describe the weekend here in Austria,” Ticktum said on Instagram, before later removing the post. “I don’t like pointing fingers at anyone but to be honest, this weekend the pace in the car was not there. Set up mainly, as in the last race when we got the car better, we were pretty quick climbing from 7th to 4th. “However compared to the top 2 no one on this grid had a chance. Even their other team mates who are good drivers were nowhere compared to them. “Interesting is how I would describe their pace and I am confident many people in the f3 paddock will agree. Ticktum is a firm contender to drive for Toro Rosso next season, but even if he was able to re-take the World Championship in the final race it would still leave him 10 points short of obtaining the necessary superlicense to race in Formula 1. Latest reports have said Toro Rosso would be willing to wait until winter testing to announce their full 2019 line-up, which would give Ticktum the chance to get to the magic 40 mark by competing in other formats such as the F3 Asian Winter Series in January and February. Schumacher’s recent rise, though, has put him firmly on Formula 1’s radar, although Toro Rosso themselves say they have had no contact with him. 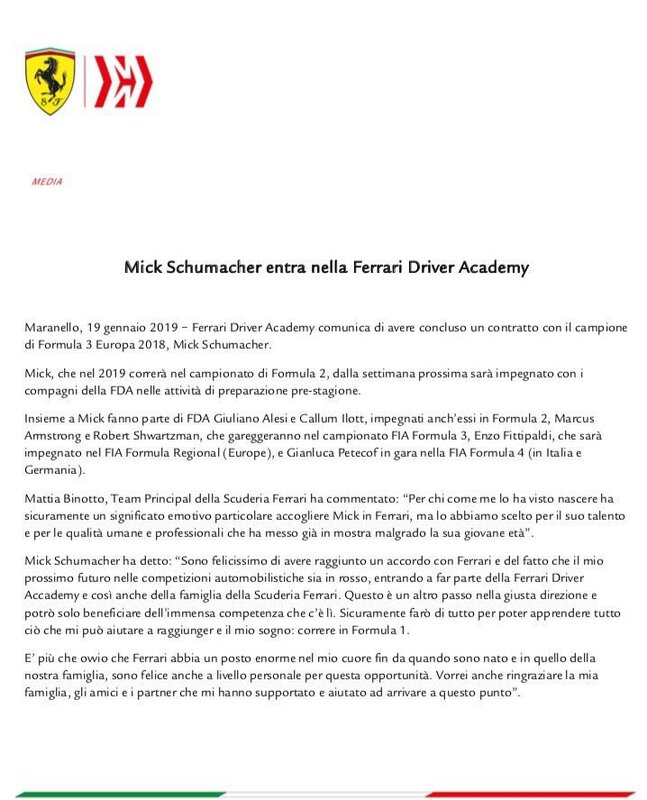 Ferrari have said the “door is always open” for Schumacher, but team principal Maurizio Arrivabene stated his desire for him not to be rushed into Formula 1 and continue his development with Prema through the junior ranks. The final round of the F3 season is on October 13-14. Schumacher came from behind to lead the standings in a sudden burst of form. Schumacher, the son of seven-time F1 World Champion Michael Schumacher, has refused to engage in a verbal battle with his rival. He told Speedweek: “I do not listen to something like that. The car is terrific to drive. We’ve evolved as a team, while others may have stopped at one point. “I wish him good luck that he stays in the title fight. But I focus on myself, that’s my key. Mick has done it. He's the F3 champion! F2 next year, hopefully! yep, 2018 F3 Champion. Congrats Mick. Job well done. Hopefully one day I will also say "our Mick"...........hands off Toto. He will race in red. I like the way Mick wants to make his own way, come up the ranks on merit and not use his family name to his advantage which he could of. I see a very mature, focused individual who understands his path in life and the pressures along the way. We might see him driving the red cars sooner than we think. According to OmniCorse there's a very possibility Mick will be listed as a test driver for the practice sessions as early as this year! It's a "publicity stunt" for 2 days only during Barcelona or Bahrain. [Mick Schumacher, son of the GOAT Michael Schumacher, will drive the new "project 670."] Honestly, he really has nothing to offer during testing as opposed to Seb; obviously. Hope he gets signed on the FDA. If he drives during testing, the papers and media, especially Italian media, will harken back to yester-year and the "passing of the torch." Again, hope he proves himself on merit alone and not because he's the son of an F1 GOAT and he's not pressured by the media. I wish all the best for him. I am going to disagree. He is already well placed to his new team so hopefully he will continue to evolve. Meanwhile driving a top grade F1 car at one ore more testing events can only help him get experience. Of course, getting signed to the Ferrari Driving academy is only going to do him good. But we can only hope to see him continue to this path. Heard he is signed to the FDA, good news and we will see if he is the real deal LeClerc and Schumacher sounds like a nice line up to me! It seems that for some people Seb is already in the last chance saloon at Ferrari, but I wonder what the reaction will be if he manages to give us a WDC in 2019? 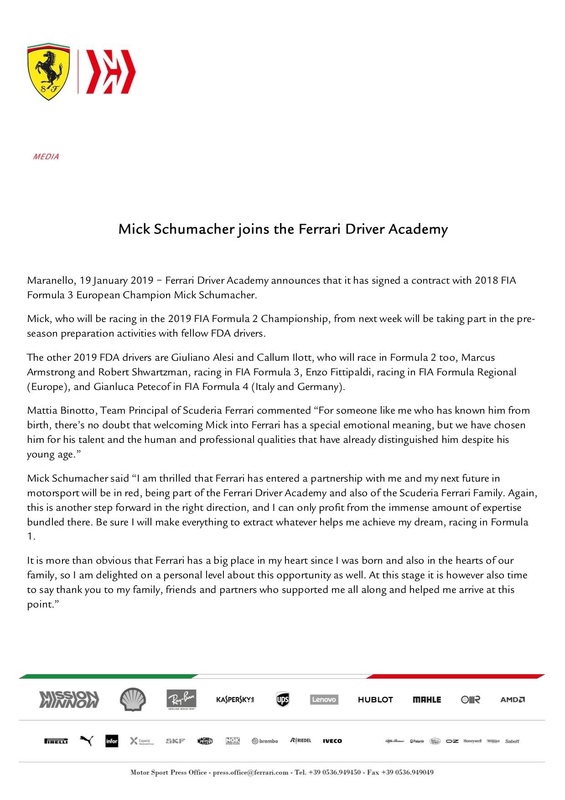 The thought of Mick Schumacher as a future Ferrari driver is certainly cause for excitement, but let's not get ahead of ourselves!! I'm still backing the talent we have in Seb and Charles, but both need to prove themselves and keep cool heads under pressure. The team of Seb and Charles are for sure WDC, WCC capable and so is Ferrari , the team. I just find it hard to believe Merc will not do all they can to have Mick with them in F-1. Bottas is surely a driver that is wanted in the market place. A new era has begun, for sure, let's pray that it will reap rewards! At least Merc didn't get him, yet. I can only wonder how Antonio G fits into the Ferrari family? If he has a good year or two with Sauber with Kimi guiding him, and all he already knows. Whatever the combination down the line I hope it puts Ferrari in that WDC, WCC winnings!! It appears that Ferrari will be spoilt for choice down the line...……….just think what that will do to driver motivation. Alfa Sauber for Ferrari is the equivalent of Toro Rosso for RedBull. Kimi and Antonio will be testing upgrades, wait and see ;) eventually Kimi will retire and maybe Mick might join the team then we have to see who will replace Vettel of the two. There are talks of Lewis joining Ferrari in 2020 but god forbid that happens... at least for imo lol! maybe Mick might join the team then we have to see who will replace Vettel of the two. Mick could also join HAAS too before jumping into the "big boys seat" with the Scuderia.......it's a maybe.....given he has choices with Alfa-Sauber or HAAS. Why did they elect to keep GRO is beyond me. just my 2 cents. Jean Todts son looking to be Micks managing agent......whom get "preferential" treatment with Ferrari. Helps if your dad is an FIA "big wig" and has "history" with Ferrari. Again, it would only seem right.....Todts and Schumachers?? ?